It has now been determined that it was the use of melamine that affected pets across the country and not rat poison. This entry was posted in Uncategorized on March 31, 2007 by CoronaTheDogo. The cause of the food recall was RAT POISON!!! This entry was posted in Uncategorized on March 25, 2007 by CoronaTheDogo. There’s been a major recall on soft pet food for both cats and dogs sold in a lot of popular stores. It’s been proven that something about this particular type of food has caused kidney failure and deaths. Researchers are still trying to determine exactly what went wrong. If you have any of the following brands of food please replace them in your pets diet immediately, small portions at a time. Americas Choice; Preferred Pets; Authority; Best Choice; Companion; Compliments; Demoulas Market Basket; Fine Feline Cat, Shep Dog; Food Lion; Foodtown; Giant Companion; Good n Meaty; Hannaford; Hill Country Fare; Hy-Vee; Key Food; Laura Lynn; Liâ€™l Red; Loving Meals; Main Choice; Nutriplan; Nutro Max Gourmet Classics; Nutro Natural Choice; Paws; Presidents Choice; Price Chopper; Priority; Save-A-Lot; Schnucks; Sophistacat; Special Kitty; Springfield Pride; Sprout; Total Pet; My True Friend; Wegmans; Western Family; White Rose; and Winn Dixie. Americaâ€™s Choice; Preferred Pets; Authority; Award; Best Choice; Big Bet; Big Red; Bloom; Bruiser; Cadillac; Companion; Demoulas Market Basket; Fine Feline Cat; Shep Dog; Food Lion; Giant Companion; Great Choice; Hannaford; Hill Country Fare; Hy-Vee; Key Food; Laura Lynn; Loving Meals; Main Choice; Mixables; Nutriplan; Nutro Max; Nutro Natural Choice; Nutro; Olâ€™Roy; Paws; Pet Essentials; Pet Pride; Presidentâ€™s Choice; Price Chopper; Priority; Publix; Roche Bros; Save-A-Lot; Schnucks; Springsfield Pride; Sprout; Stater Bros; Total Pet; My True Friend; Western Family; White Rose; Winn Dixie and Your Pet. This entry was posted in Uncategorized on March 20, 2007 by CoronaTheDogo. This puppy is still looking for a home and needs your help. Please let him know how much you care by emailing right away and cheer him up. This entry was posted in Uncategorized on March 18, 2007 by CoronaTheDogo. Yes, Blaze is still up for adoption. There may be some concern about adopting a nine year old dog but this is the chance of a lifetime. 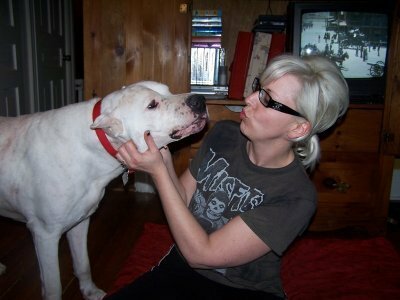 What better chance will you have to get to know and care for a Dogo Argentino and not have to train a puppy? Blaze be great a great friend for the person unfamiliar with the breed and also for those who are. Starting training class on Wednesday Blaze has come a long way from where heâ€™s been but would love your care and attention. 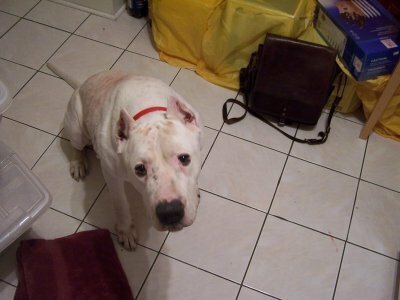 Heâ€™s at a really good weight now, thanks to Meredith, and is brilliant white in colour. With clipped ears he is beautiful enough to be a Dogo. 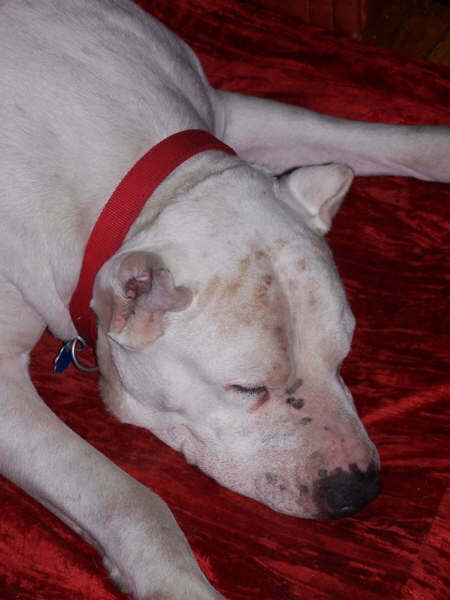 Meredith loves this dog, as you will, but Blaze would love to have his own home or a kid to play with. Email info@iamcorona.com or mizdeath@hotmail.com now so your chance doesnâ€™t get taken. 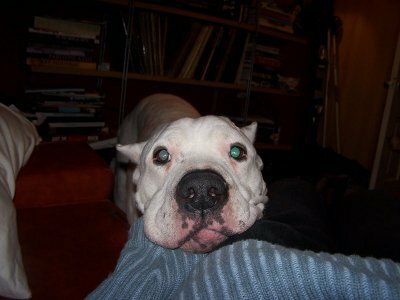 This entry was posted in Corona's Dog Friends on March 9, 2007 by CoronaTheDogo.